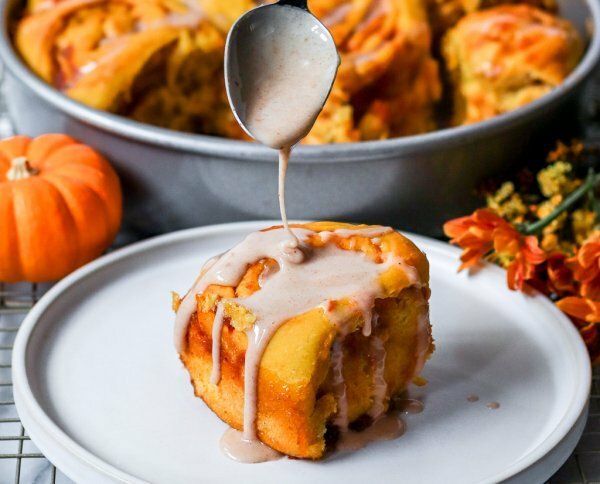 The BEST Fall cinnamon rolls are finally here & they are filled with loads of pumpkin- WAHOOO! 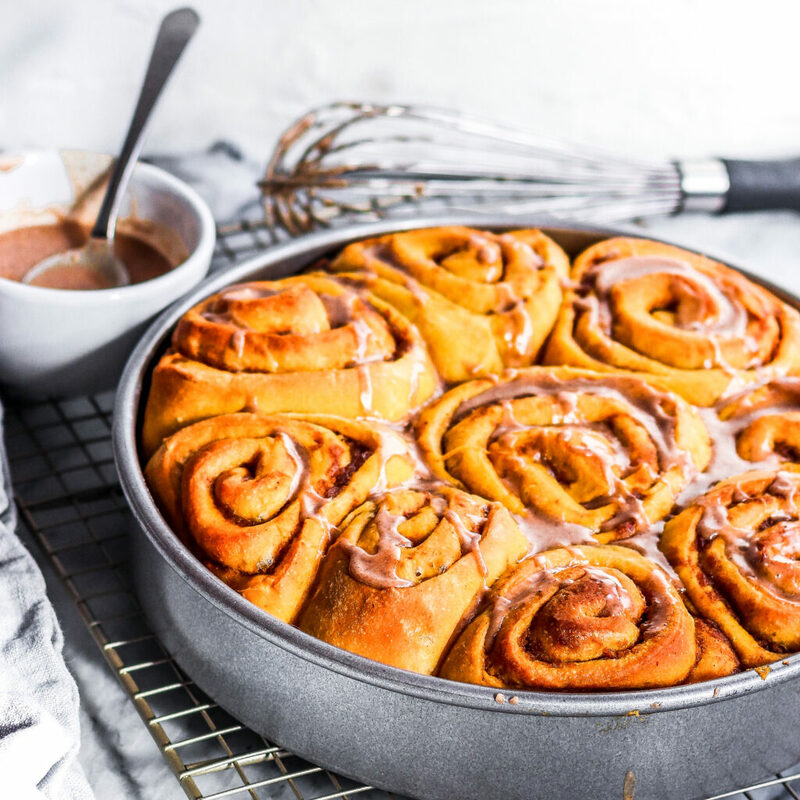 I can’t wait to see all your recreations because I know you will be making these Vegan Pumpkin Pie Cinnamon Rolls all season long! If there’s anything I love more than Fall & pumpkin picking, it’s all the glorious baking you can do with the produce in season this time of year. Growing up, I only ever ate cinnamon rolls if they were from a Pillsbury can, so learning to make my own at home has been a real treat. Maybe I’m alone in this thinking, but what I love about cinnamon rolls is the time & labor it takes to make them. You have to wait to let the dough rise twice for the perfect texture and all that waiting is where the magic happens. I’ve tried making buns where I only let the second rise last 1 hour vs. overnight and they did not have that perfectly yeasty taste. It’s kind of like those recipes that tell you to chill cookie dough for 24 hours. We all hate the wait, but know it is SO worth it! Plus then you can feel like a kitchen queen (or king) when you wake up in the morning, preheat the oven, pop those buns in the oven, and wake up to a morning feast! 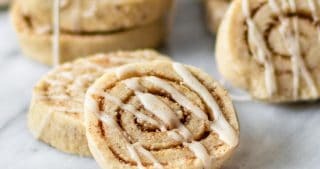 These buns are made just a bit extra because, in addition to putting pumpkin puree into the bun dough, I also mixed it into the cinnamon sugar filling. This truly made these buns taste like a pumpkin pie in bun form! This did lead to the challenge of some extra messy filling, so you’ll need to be extra careful when rolling your dough to keep all the goodness inside. Then, I went one step further and added pumpkin pie spice to the glaze to give it that perfect cinnamon & nutmeg filled kick. Basically, these buns are the best of fall through and through. 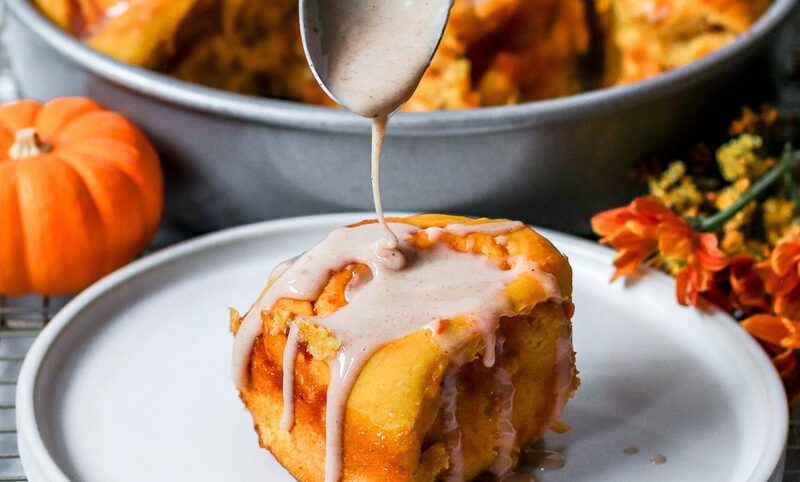 Enjoy all the pumpkin filled weekends ahead with these delicious morning buns! I seriously couldn’t bake as much as I do without my KitchenAid Standing Mixer. I know it’s a rather big investment, but it is worth every penny. I’ve had mine for 5 years and it hasn’t failed me yet. Plus the dough hook works wonders when I’m too lazy to knead my own dough! I cook my buns in this super basic USA Bakeware 10″ Pan. You can also bake these buns in a skillet or sheet pan, just try to make sure all the buns are pressed closely together pre-bake or you might over cook them. If you are looking for a more sustainable product to replace plastic wrap, I can’t recommend Bee’s Wrap enough! I like this starter pack because it contains one of each size, and you will need the large size to cover your bowl and 10″ pan while the pumpkin buns rise. Last but not least, you can’t have Pumpkin Pie Buns without Pumpkin Pie Spice. This Pumpkin Spice Blend by Simply Organic is my go to! Begin by adding your warmed almond milk, pumpkin puree, vanilla bean paste, and yeast to a large mixing bowl. Let sit for 5-10 minutes to make sure the yeast is activated. You will be able to tell if it's bubbling. After the 10 minute mark, add the sugar and melted vegan butter to the large mixing bowl and whisk until combined. Once mixed, gradually begin adding in your flour. If you are using a standing mixer make sure to use the bread hook, add your flour 1/3 cup at a time, and then kneed 5-10 minutes. If you are kneading by hand, mix the wet ingredients and flour together until a sticky dough is formed, generously cover your hands in flour, then remove from the bowl and kneed for 10-15 minutes on a well floured surface or until the dough is elastic and significantly less sticky. (Since the dough has pumpkin in it, it will be stickier than normal bun dough, but should firm up a lot during kneading). Once the bread is ready, add it to a well oiled bowl for the first rise. The dough will be sticky so you may want to flour your hands before grabbing the dough. Cover the bowl, place in a warm place, and let rise 1-2 hours until doubled in size. I like to test my dough by "poking" it with a finger. If it doesn't bounce back, it is ready. Once the dough has doubled in size, turn out the dough onto a well floured surface. Roll the dough into a 1" thick rectangle that is around 9*14 inches. You don't want the dough to be too thin or you will have a hard time rolling it up once the filling is inside! In a separate bowl, whisk together the filling ingredients including the pumpkin puree, brown sugar, white sugar, and pumpkin pie spice. Spread the mixture over the rolled out dough leaving some space along the edges. Roll the dough up tightly the long way, making sure to keep the filling inside as it will be a bit messy. Pinch at the seams to seal. Turn the buns upside down so the seam is on the bottom. Cut the buns into 8-10 even peices. Arrange the rolls into a greased 10 or 11" round cake pan or skillet. Cover with plastic wrap or a similar material and put in the fridge to rise overnight. In the morning, remove the buns from the fridge and remove the plastic wrap. Brush the buns with an additional 1 tbsp of melted vegan butter prior to baking. Preheat the oven to 350F. Bake the buns for 35-40 minutes until the tops are beginning to brown. While the buns are baking, make the glaze by whisking together the powdered sugar, pumpkin pie spice, and almond milk. Once the buns are cooked remove from the oven and let cool in the pan. Top with the glaze and serve!